Mt. Amagi (天城山) is one of the popular mountain located in Izu Peninsula. 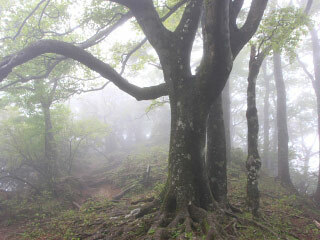 It is chosen as one of 100 best Japanese mountains. There are 3 peaks in Mt. Amagi. The tallest mountain is Mt. Banzaburo that is 1,406m. It is very popular mountain with beautiful buna trees. You can enjoy hiking under deep forest. It is Azalea spot in Shizuoka prefecture. Trekking takes about 4 hours. Park at Amagi Highland Golf Course. Drive route 135 to 111 west. Mt. Amagi is a group of mountains located southern Izu Peninsula. It was formed by the volcanic activities from 800,000 years ago to 200,000 years ago. Because it has many rains with warm weather, it has a deep forest of buna trees. It is well known as Azalea mountain. Trekking takes about 4 hours from Amagi Highland Golf Course.